Cropping photos – cutting them down to a size you prefer – can easily be done in as little as a few seconds with a basic photo editing tool. Whether you need to cut out unnecessary visual aspects or change the shape or aspect ratio of the photo, cropping is the way to go for quick results. 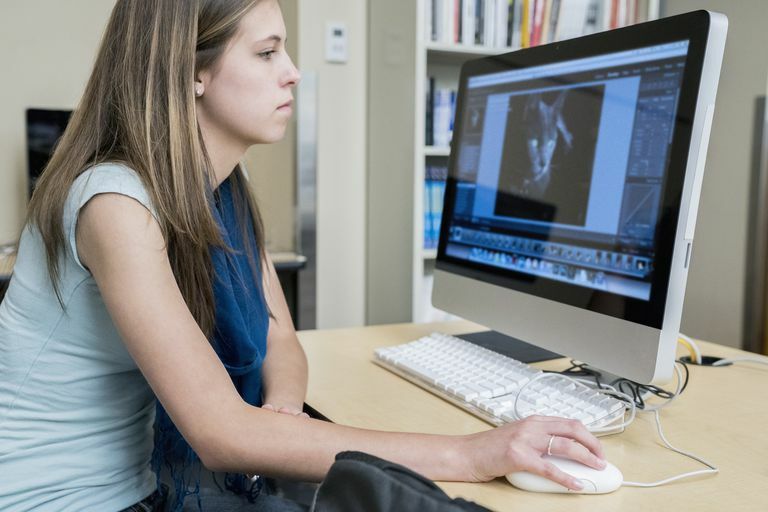 Below, you'll learn how to crop photos on a PC or Mac using your computer's respective built-in photo editing program. You'll also learn how to crop photos on a mobile device using a free photo editing app. It's easy, fast and actually pretty fun once you get the hang of it. If you're a PC user running on Microsoft Windows, you can use a built-in program called Microsoft Paint to do your cropping. You can find Paint under All Programs by accessing the Start menu. To open your photo in Paint, click File > Open and select a file from your computer. Now you can start cropping. Click the crop selection button in the top menu, identified by the rectangular crop icon that has a Select label at the bottom. Once clicked, it should turn a light blue color. Now when you move your cursor over your photo, you can click, hold and drag out the rectangular crop outline over your photo. When you let go of your mouse, the crop outline will still be there and you'll be able to click on any corners or mid-points (marked by the white dots) to reposition it. If you want to start over, simply click anywhere on the photo and the crop outline will disappear. When you're happy with your crop outline, click the Crop button in the top menu to finish the cropping. You can also adjust image sizes while in Microsoft Office. As an alternative to rectangular cropping, Paint also has an option for free-form crop selections. So if you wanted to crop out the entire background of the photo in the example above, you could slowly trace around the hand and flower using the free-form crop selection to do it. To use the free-form crop selection, click on the arrow beneath the Select label on the crop button in the top menu. From the drop-down menu, click Free-form selection. Click anywhere on the photo where you want to start your free-form selection and hold it as you trace around the area you want to keep. Once you've made it back to your starting point (or simply let go), the crop outline will appear. Click on the crop button to complete your free-form crop selection and the area of the photo outside the crop outline will disappear. If you'd rather crop around the area of the photo that you want to get rid of, which can be much easier to do in some instances, you can select Invert selection from the dropdown menu when you click Free-form selection and draw your crop outline. To get rid of the white space around the cropped area of the photo, click Transparent selection from the dropdown menu when you click Free-form selection and draw your crop outline. If you're a Mac user, you'll have a program called Photos installed on your machine that allows you to do your cropping. To access it, click the Applications icon in the bottom menu, scroll down and click Photos. Click File > Import to choose a photo from another folder to Photos if you need to or simply double click on an existing one in Photos to open it. Click and hold your anywhere on the photo. Drag it to see the cropping outline expand. You can do this in one hold or alternatively let go of the hold on your cursor. The crop outline will still be there and you'll be able to use your mouse to click and drag any of the blue dots that appear on its sides and corners to adjust their lengths. When you're happy with your cropping outline, click the Crop button in the top menu to crop the photo. Photos won't allow you to crop a photo as a free-form selection like Paint does, but you can at least crop photos as circles or ovals. It's easy to do this with just one small change to the instructions given above. With your photo open in Photos, click on the arrow to the right of the crop icon to select the Elliptical Selection. The crop icon should change to a circle. Now when you go to crop your photo by clicking, holding and dragging your cursor across the photo, you'll see a crop outline in a circular shape. Just like the rectangular selection, you can let go of your cursor and click the blue dots to drag the crop outline around so you get the perfect fit. Remember to click the Crop button in the top menu when you're done. To crop photos on your mobile device, you can take advantage of countless free photo editing apps out there, but for the sake of keeping things simple we'll use Adobe's Photoshop Express app. It's free to download and use on iOS, Android and Windows devices, and no — you don't need to have an Adobe ID to use it. Once you've downloaded the app and opened it, you'll be asked to give it permission to access your photos. After you do, the app will show you all your most recent photos stored on your device. Select the photo you want to crop and then tap the crop icon in the bottom menu. A crop frame will appear over the photo and you'll be able to use your finger to drag the crop outline around the area of the photo you want to crop. Alternatively, you can select from different crop frames for specific aspect ratios that fit certain social media posts. These include ones that fit Facebook profile cover photos, Instagram photos, Twitter post photos and more. When you're done, you can save the crop by simply navigating to the next step using the other menu options at the bottom and top of the screen. If cropping is all you needed to do, just tap the save button (marked by the square with the arrow in it) in the top right corner of the screen to save it to your device or open/share it within another app. Is There an Option for Using Instagram on Your Mac or PC?